I am a first year PhD student in the LOCEAN (French oceanographic laboratory). I have been part of the RV Tangaroa Mertz Polynya Voyage 2013 science team because my research topic is oceanic circulation on the Adélie shelf. During the voyage I have learnt a lot from the experienced scientists on board. 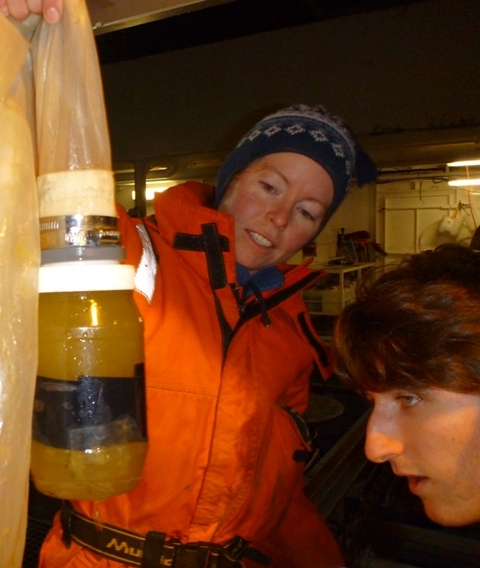 I have been on the CTD night watch; my shift mates taught me the important steps for collecting a successful CTD cast (see blog post 29: The CTD) and I have learnt how to take water samples – it’s not as simple as you think! I was also responsible for the LADCPs on the CTD, during the night watch. These instruments allow us to get a snapshot of the current during the CTD cast based on the Doppler Effect (see blog post 29: The CTD). 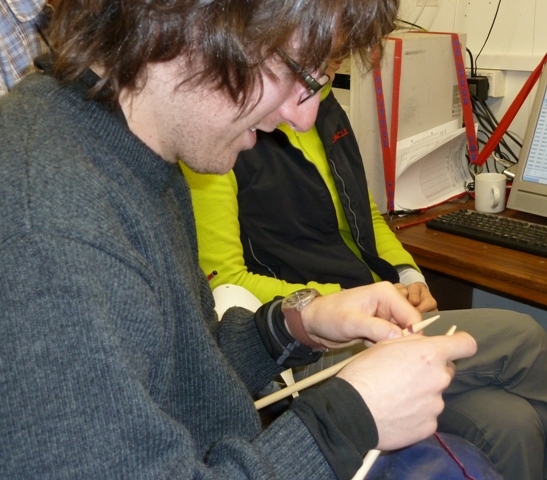 While we are sometimes serious and talk about science during our CTD watch, we have also spent some of the time singing along to the guitar or ukulele, learning to knit and crochet, and improving my English. A ship is a kind of little self-contained town for 6 weeks. An oceanographic ship is an entire ecosystem of people chosen for their different expertise and skills and who want to understand a region of the ocean – they all share the aim of achieving good science. As you will have read on the previous blog posts, a large number of science activities have been done on board during the voyage: water sampling, coring, chemistry, mapping of the sea floor, cooking, engineering, winching…I have enjoyed discovering how each of the activities contributes to answering the different scientific questions we have about the region. Although the crew and scientists form a good team, in reality the weather and the sea ice have controlled the voyage activities. Unfortunately the sea ice barred our way; it stopped the ship from getting in to the Mertz Polynya and forced us to change our plans. It was a big disappointment not to be able to reach the Australian and French moorings. I have discovered how difficult it is to get any oceanographic data, especially south of the polar circle. Fortunately for my PhD I will also be working on an existing dataset that has been collected by the French oceanographic team since 2007. However, due to the sea ice affecting our initial plans, I have also learnt a lot about the logistics, and ideas that go into planning new stations. When the decision was taken to do science in the canyons on the Wilkes/Adélie Margin (see blog post 26: Mud, mud, glorious mud), we looked at the work which had already been done in the area to choose important sites to get new profiles. I have also got a better understanding of the huge change in the sea ice distribution due to the Mertz glacier tongue calving. I will analyse the oceanographic data from the Adélie shelf with new insights and a better understanding of the region. I hope I will return to the Southern Ocean and next time get on to the Antarctic shelf.